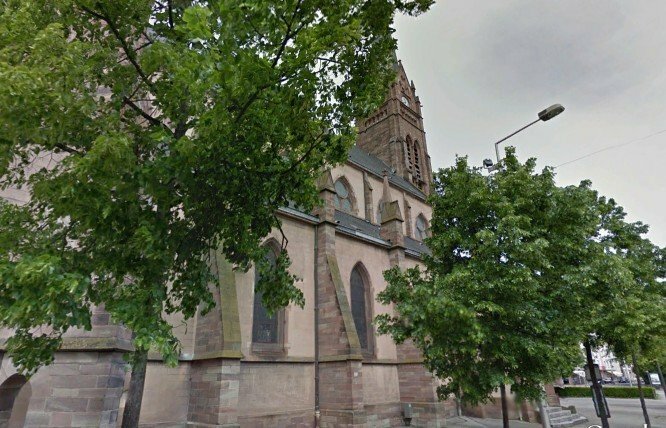 Reference number for this case: midsep-54-Colmar. Thank you for including this reference number in any correspondence with me regarding this case. "A gatekeeper told us these days the following fact: in the day, around 3 p.m., he saw suddenly above the Church of St. Joseph a luminous and transparent ball which descended vertically and fairly slowly over the street of Logelbach before rising above the warehouse of the Red Cross in Talbahnstrasse. It seemed to our correspondent that there was like a door on this ball." A gatekeeper told us these days the following fact: in the day, around 3 p.m., he saw suddenly above the church of St. Joseph a luminous and transparent ball which descended vertically and fairly slowly over the street of Logelbach before rising above the warehouse of the Red Cross in Talbahnstrasse. It seemed to our correspondent that there was like a door on this ball. It is not at all my habit to "advertise" a book or anything, and I have no interested relationship with the author, but I wanted to say a word on the book by Christian Valentin, "Mythes et Réalités des Phénomènes Aériens Non Identifiés" (i.e. "Myths and Realities of Unidentified Aerial Phenomena" (cover on the left), ref. [cv2]; which, as its subtitle indicates, is about Alsatian UFO sighting reports and the saucer lore in Alsace. The witness said that the thing was over the church - a sure landmark - and above the street of Logelbach, a less obvious landmark since we do not know where above this street. I have the impression that he was at the east or south-east of the church, and the UFO was West or Northwest, but it is not certain. Of course, the UFO could be very far away, we do not know anything about the distance. I have not been able to locate the "warehouse of the Red Cross in the Talbahnstrasse" . The "Bahnstrasse" would rue de la Gare now. Talbahnstrasse would rather means "street of the train to the Valley" , a street that would be along the train up to the valleys of the Vosges to the west, as opposed to Bahnstrasse, the main North-South railway of the Alsace valley, perhaps. 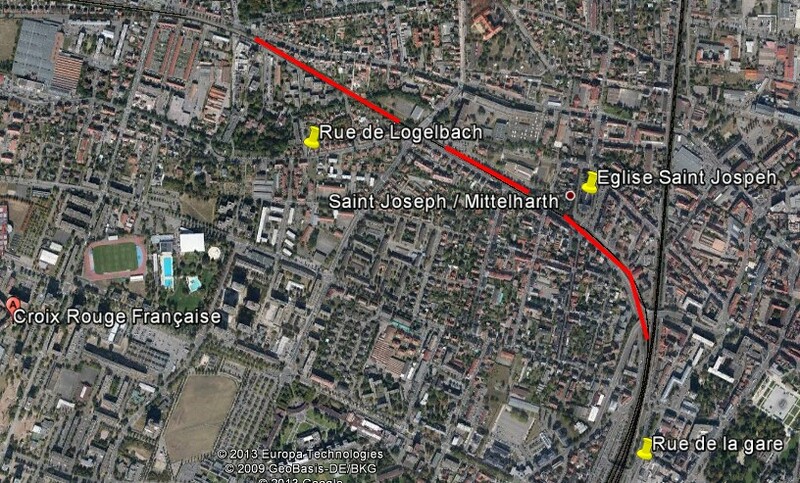 On my map, I show the street of the station, "rue de la Gare", the train station, the Red Cross which is probably now in a different place than in 1954, the street of Logelbach, the church, and the railway track which was towards the Vosges (blue line) along which there may have been a street known as "Talbahnstrasse" in 1954. As to what it would have been... A "luminous and transparent ball," with maybe a "door", going down and up. A helicopter? A bouncing meteor? So this is an "undidentified" but without enough information, to me. [---] Article in the local newspaper Dernières Nouvelles du Haut-Rhin, Colmar, France, September 25, 1954. 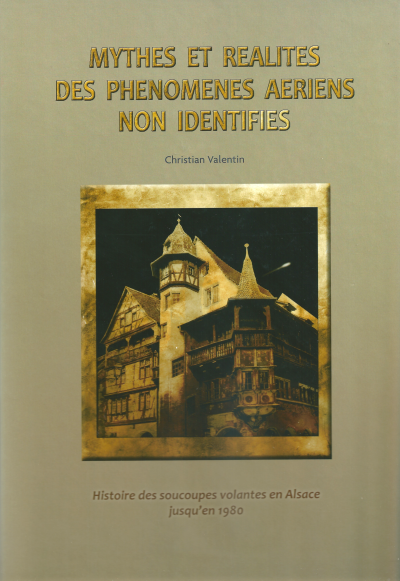 [cv2] "Mythes et Réalités des Phénomènes Aériens Non Identifiés - Histoire des soucoupes volantes en Alsace jusqu'en 1980", book by Christian Valentin, Grimoires d'Alsace publishers, France, page 29, 2012. 1.0 Patrick Gross March 27, 2014 First published, [cv2]. 1.1 Patrick Gross October 13, 2016 Addition [sp6].